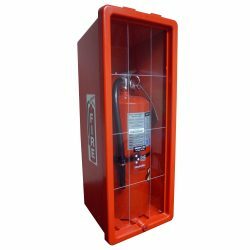 The Fire Extinguisher & Cabinet (FE-20) includes a 20-pound (9-kilogram) capacity, Type ABC fire extinguisher, and a front-loading cabinet. This multipurpose fire extinguisher is designed for use in combating nearly any fire risk including Class A (trash, wood, and paper), Class B (liquids and gases), and Class C (electrical) fires. The cabinet is for indoor or outdoor use and protects the extinguisher from dirt, debris, water, and chemicals. There are numerous warehouse areas where fire risks increase. Equipping these spots with a BHS Fire Extinguisher and Cabinet allows staff to quickly smother fires that could otherwise cause serious damages. A small investment in Fire Extinguishers can save lives as well as entire structures and their contents. Give your workers protection they can trust with warehouse fire-safety equipment from BHS. Contact our sales team at 1.800.BHS.9500 to learn more about the BHS Fire Extinguisher and Cabinet.